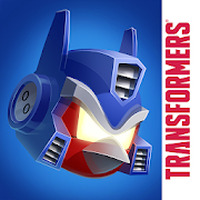 Angry Birds Transformers Android - Free Download Angry Birds Transformers App - Rovio Mobile Ltd.
"GEt ready for exciting adventure of angry robot birds"
Game Goal: The angry birds are back (again! ), and this time they joined the Transformers, forming autobirds! Your goal is to prevent the invasion of EggBots and defend the Island of the Pigs. How to play: While you run, shoot at strategic places of your enemies' buildings to make them fall down easily. Game Options: Unlike other games in the franchise, in Transformers Angry Birds the main characters protagonist runs through the sceneries as he aims and shoots at his opponents. Graphics: The 3D animations have a high level of detail and the movement of the characters is very smooth. Sound: The shots and explosion effects are fun and exciting. Content classification: For all ages, especially for followers of this great franchise games. Installation requirements: A minimum of 68M of free memory space and Android 4.0 or higher. Rating: The TOP 5 Most popular games in Transformers Games category. Ranking: The TOP 1 Most downloaded games in Transformers Games category. Very good music and sound effects. Displays a lot of advertising. Many of the items are on sale at the game store. Do you like Angry Birds Transformers? New Angry Birds game launches worldwide tomorrow! Help the Angry Birds get a good nights sleep finally! Find all the Hatchlings and get the party started! The legendary Angry Birds are back with more action! Join the Angry Birds in their island adventure! Tap & match your favorite Angry Birds!